One Magic Christmas DVD from DVDLand. Award-winning actress Mary Steenburgen (Melvin and Howard) gives a solid performance as Ginny Grainger, a young mother who rediscovers the joy and beauty of Christmas, thanks to the unshakable faith of her six-year-old daughter Abbie (Elisabeth Harnois) and Gideon (Harry Dean Stanton), Ginny's very own guardian angel. Ginny's wondrous experience will touch your heart and warm your soul in the timeless tradition of past Disney favorites. 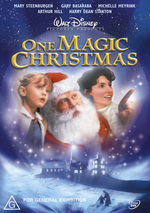 One Magic Christmas fulfills all your most treasured Christmas fantasies. Share it with those you love. Click the button below to add the ONE MAGIC CHRISTMAS to your wish list.